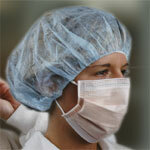 Lab Supply proudly supplies a wide selection of personal protection equipment from Life Science Products. Our selection of professional grade personal protection equipment includes isolation gowns, face masks, surgical caps and more. Our caps are made from polypropylene and are fully disposable for your safety and convenience. These surgical caps come in both blue and white and multiple sizes as well. These bouffant caps are perfect for animal facilities and laboratories. If you are interested in this product, then please click here to view these products in our store. Here at Lab Supply, we are committed to making sure you find exactly what you are looking for. If you have any questions about the surgical caps that we offer, then please click here to visit our contact page. We will be more than happy to answer any questions you may have.